Anglers White River Resort is located directly on the banks of the White River near Mountain View, Arkansas, at the point where Sylamore Creek flows into the White River. That makes Anglers the perfect jumping off point for floating the White River and for trout and even small and large mouth bass fishing. Our section of the White River is full of clear, cool water (it feels great on a warm Arkansas summer day!) and the gently moving water makes it an easy float for the entire family. We have canoes and kayaks for rent or you can take the whole family in one of our large yet easy to manage inflatable rafts. 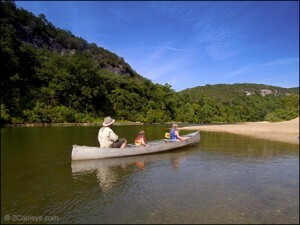 Better yet, rent a combination of boats and let everyone take turns in the canoes and kayaks! We’ll do all the “heavy lifting” for you! We have all the boats and equipment available to rent and our store has all the picnic supplies you will need. We’ll transport you up river to put in for either an 8 mile or 17 mile float down the White River. At the end of the float trip you arrive at our easy access grass lawn and you are right back at Anglers White River Resort with your car, room, cabin or campsite nearby. All of our canoe/raft trips include jackets and paddles.